Many people believe that their heating and cooling system is already cleaning the air of these pollutants and allergens. Most systems are equipped with a standard 1: throwaway air filter, but these filters are designed primarily to keep large particles from damaging the equipment. They are not designed to actually clean the air. We believe that your heating and cooling system should clean as well as condition the air. AccuClean will help your system do just that far better than any other air filtration system on the market. When you choose an American Standard AccuClean unit for your home, you get the most effective air filtration system in the nation period. It can clean up to an astonishing 99.98% of allergens from the filtered air that you family breathes, so everyone will feel more comfortable, no matter what the season. * Just think: with AccuClean, the majority of irritating particles like dust, pollen, pet hair and dander, dust mites, mildew, lint, fungus, most tobacco smoke, cooking grease, even bacteria, will be removed from the filtered air. What’s more, this revolutionary technology can trap allergens down to .1 micron in size. Particles like dust, soot, mold spores and bacteria are often .3 microns – so small that 2 million of them could fit on the period at the end of this sentence. These allergens can get deep into your lungs because they aren’t filtered well by your nose and throat. AccuClean removes tiny particles like these, effectively reducing the potential triggers for asthma and allergy attacks. Why is American Standard AccuClean air filtration better than the rest? The reason is simple, really. It’s all in the technology. 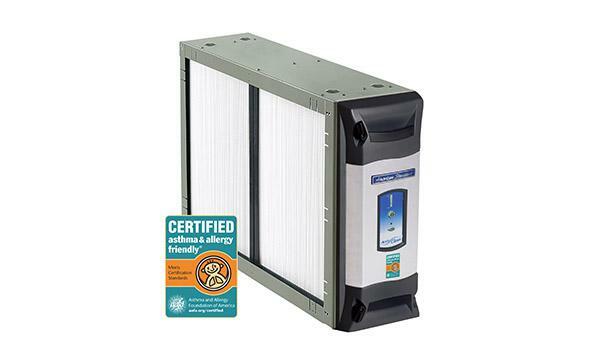 Other filters, such as HEPA filters, trap airborne particles by forcing air through very dense mesh screens. Although these screens are effective at catching dirt, over time they become clogged and hamper airflow. The result is what’s referred to as a “pressure drop,” meaning the amount of air that can flow through the filter is considerably less. In other words, less air is cleaned less efficiently. Not so with AccuClean. This patented design gives you long-lasting and consistent performance with the lowest pressure drop and highest efficiency of any filtration system on the market. That means cleaner air than you’ve ever experienced before. *Up to 99.98% effectiveness down to .1 micron applicable to AFD models. Other models may vary. AccuClean is a whole-home air cleaner, meaning it works in conjunction with your heating and cooling system to clean up to 99.98% of airborne allergens from filtered air in every room of your home. Compare this to plug-in air cleaners that operate in a single room. To match the effect of a whole-home system, you’d have to buy several plug-in cleaners at a cost of $300 to $500 each. Even then, plug-ins are only effective within a certain radius, potentially leaving much of the air in the room unfiltered. The AccuClean whole-home air filtration system is the best way to make sure your family breathes air that’s exceptionally clean – no matter what room they’re in – for maximum comfort. A heating and cooling system is only as good as the sum of its parts. And, even though each component is separate, they’re all designed and engineered to work together as a “matched system.” With AccuClean as part of an American Standard matched system, you can rest assured that you’ll experience maximum comfort, efficiency and clean air. This is especially true if you install AccuClean into a system that features a variable-speed fan motor. Not only will you be able to clean up to 99.98% of allergens from the filtered air, you’ll be able to reduce dust mites by keeping the air below 50% humidity. And since a variable speed motor operates at a lower speed most of the time, you’ll also save energy – and see lower utility bills** – while breathing cleaner air. Air cleaner: available in a variety of models, from standard filters to fully integrated whole-home air filtration systems that remove up to 99.98% of airborne allergens from the filtered air in your home. Indoor coil: the other, less visible half of your heat pump. As indoor air flows across it, heat and moisture are drawn out, leaving air that is cool, comfortable and conditioned. Some consumers have expressed concern about the ozone emissions of ionic air cleaners. It’s a valid concern, and one that American Standard Heating & Air Conditioning takes very seriously. Research has shown that plug-in air cleaners emit the highest levels of ozone while whole-home systems like AccuClean deliver almost none. In fact, AccuClean was designed to fall well below the FDA voluntary emissions limit for medical devices. American Standard considers safety and quality to be top priorities. So you can rest assured that the clean air delivered throughout your home by AccuClean is good for you and good for the environment.